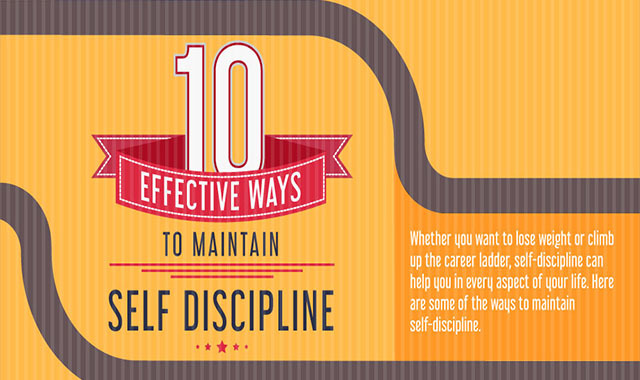 10 Effective Ways to Maintain Self Discipline #infographic ~ Visualistan '+g+"
Did you know about the quality needed to accomplish your goals and live a healthy and happy life? The answer is self-discipline. According to a study conducted by Wilhelm Hoffman, people with high level of self-control and self-discipline tend to be much more satisfied and happier than people who do not have self-discipline. The reason is that self-disciplined people are in a much better position to deal with goal conflicts. In short, they can take can right decision easily without haggling over it for a long time, which not only comes in handy both in their personal and professional lives. With so much going on around us, it can sometimes be very difficult to maintain self-control and you might easily loose the plot. Staying self-disciplined consistently for long period is one of the hardest things to do but you can succeed at it by making few changes to your lifestyle.